Born in Glasgow, he joined the firm of Honeyman, Keppie & Mackintosh in 1904, and worked closely with C R Mackintosh on his designs for the Ingram Street Tea Rooms, designing the interior details, furnishings and carpets of its Oval Room himself. He also produced the perspective drawings of Mackintosh�s Auchinibert at Killearn for publication in the architectural press (1906). He also taught at the Glasgow School of Architecture as an assistant to Eugene Bourdon, and won the RIBA Arthur Coates Prize in 1911. Eschewing Mackintosh�s controversial �Glasgow Style�, he worked predominantly in Keppie�s Beaux-Arts idiom for the rest of his career, producing several churches and stores in Glasgow, and the extension to Birkhall, Deeside, for the Royal family. Competitions were Henderson�s speciality. Amongst his winning designs were, the Progressive Co-operative Society headquarters (later SCWS) at Shieldhall; the demonstration School, Jordanhill (1913-20); the Glasgow Cross Improvement Scheme (1914-28); and St Ninian�s Primary School, Knightswood (1938). During World War I, he served as an officer in the Glasgow Highlanders and was severely wounded, losing the use of his right hand. On his return to Glasgow, he resumed his architectural career with Keppie after teaching himself to draw and write with his left hand, and quickly filled Mackintosh�s vacant post as Keppie�s partner. In the 1920s, he was preoccupied with radically re-designing his original plans for the Glasgow Cross Improvement Scheme, its progress having been halted by the war in 1914. 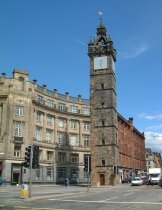 This resulted in the present form of Glasgow Cross and the building of the Mercat Building and Bank of Scotland (1921-7), but was left incomplete without its concave block on the north east side of the cross being built (the scheme involved the partial demolition of the 17th Century Tolbooth, leaving its steeple stranded on a traffic island, rather than moving it to the east side of the cross as was originally intended). 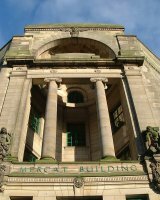 At this time he became involved with the most important sculptors and carvers in the city: Benno Schotz ; Alexander Proudfoot ; Archibald Dawson and Holmes & Jackson , who provided the Mercat Building and Bank of Scotland with their figurative and ornamental sculpture. 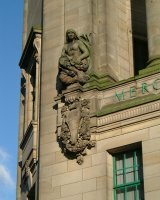 In 1929-31, he worked with Schotz on his Bank of Scotland, 235 Sauchiehall Street, for which the sculptor provided statues and heraldry in stone and bronze.The building has since been hailed as Henderson's finest bank. During World War II, he was appointed to organize the War Evaluation Department, and as the Quartering Commandant for the West of Scotland, with the rank of Lt Colonel. In 1945, he became the firm�s sole director after Keppie�s death, and eventually took his former assistant J L Gleave as his partner in 1949, as Keppie, Henderson & J L Gleave. Elected Vice-President of RIBA in 1948, he was the first practicing Scottish architect to be elected as its President, 1950. This was followed in 1951 by his election as an Honorary Corresponding Member of the Canadian and American Institutes of Architects, and to the RSA , 1953, where he exhibited his designs from 1915-61. 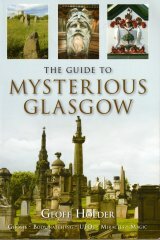 In 1951-5, he designed the Quincentenary Gates on University Avenue to commemorate the five hundredth anniversary of the founding of the University of Glasgow, and the Old College Gateway Memorial Plaque, which was mounted on a wall in the High Street to mark the original site of the university's gateway (now Pearce Lodge, University Avenue). 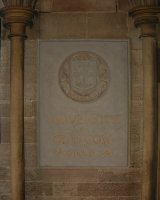 Unveiled on 9 October 1955, the plaque was carved with the university's coat of arms by Mortimer, Willison & Graham . The plaque is now in the entrance to the university's George Gilbert Scott Building at Gilmorehill, beneath its Gothic tower. Henderson died at his home at 96 Springkell Avenue, aged 81, on 23 November 1963. The firm, which had been re-named as Keppie Henderson & Partners in 1958, continued after his death as Keppie Henderson Architects, 1981-89, and then SBT Keppie, 1989-95, and Keppie Design, founded in 1995. The firm is currently run by Managing Director David Stark, who recently published a history of the firm in 2004: Charles Rennie Mackintosh and Co. 1854-2004 (Stenlake Publishing Ltd). Henderson's portrait as RIBA President was published in the RIBA Journal in July 1950.